The Before After Surgery Toolbox product has been created by Medical Intuitive Julie Lewin. It is designed to assist patients who are scheduled for surgery or who have had surgery and are not recovering as well as expected. 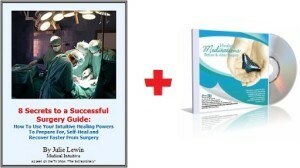 The toolbox consists of 10 healing meditations for each stage of your surgery journey and an eBook “8 Secrets to a Successful Surgery” which contains key information you should know about having surgery. How Long Does Cipro Stay In Your System? Can You Fly With A Broken Nose?